As part of that effort, the developers are asking the City Council to approve an ordinance that would exempt the project from property taxes for three years. Starting in the fourth year of the agreement, the project owners would pay 11 percent of the total taxes due, with the amount then going up by 11 percentage points a year until year 12, when 95 percent of the taxes would be due, followed by full taxation after that. Though the City Council is a vote away from enacting a tax-treaty process for developers in the Route 195 corridor that doesn’t need council approval, for the rest of the city, the old rules, which include public hearings and multiple council votes, still apply. Though the Fogarty Building’s destruction has been contemplated many times over the last several years — Procaccianti took out a demolition permit in 2011 but didn’t use it — the Fogarty Building has had its defenders. 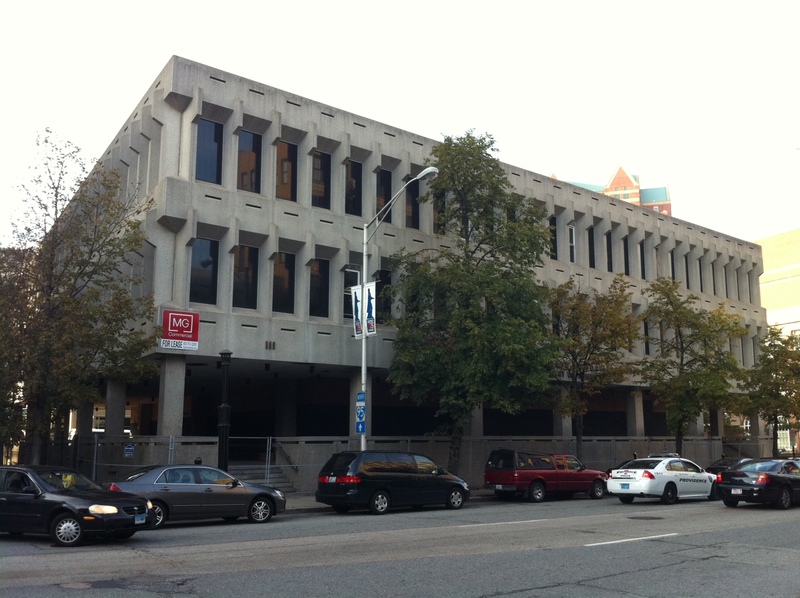 It is one of the city’s few surviving examples of the “brutalist” architectural style, which features exposed concrete and angular, fortress-like designs. The name comes from the French word for raw concrete, not physical brutality. This morning, the Procaccianti owned Old Public Safety Building Memorial Parking Lot™ has site fencing covering most of it, I don’t know why. “has had its defenders” Good grief. I will believe that a hotel will be constructed when I see it. Here comes another ” temporary ” surface parking lot. Where are all the anti-stadium deal people on this? Say what you want about the new Pawsox ownership and their potential plans–they have never screwed over the city more than the Procaccianti group has. This is going to be a hotel? I’m skeptical. 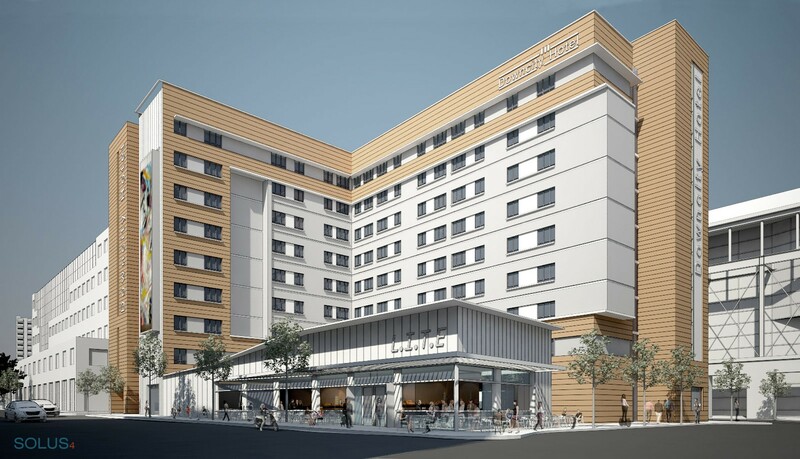 I’m not sure of any hotel brand that would fit a building like this…unless it’s an indie boutique hotel… the previous plans for this site were for an extended stay hotel, another plan for an extended stay hotel. Just seeing this developer’s name brings back lots of bad memories of promised projects that never break ground. They want to tear the building down and build this. Are those really the colors that they are planning to use? I like that they have open-air eating/hotel lobby… that’s cool, but the colors don’t say urban hotel. Hopefully they use LED lighting on the exterior to make the building feel more City and less Airport hotel. I hope there’s a pool on top of the restaurant/lobby roof, it would be a good way to use that space. Providence needs more hotel/residence building pools so we can keep more people in the City during the doldrums of summer. There is no reason why every one of these proposed hotels can’t have a pool or roof pool as part of the proposal, especially since it’s an extended stay hotel — amentities like that may drive people to stay in downtown rather than near the airport. I’m sure the render could be improved upon, but I think it’s overall nice and would contribute to DownCity’s renaissance. @KCB, I think you’re right to question the colors, though it’s always hard to make much of a render when everything but the proposed structure is drawn in shades of grey. Perhaps incorporated into a real-life palatte, it would look better? Maybe! Proc’s proposal is bland at best, but I hate the Fogarty. Not sorry to see it go IF something appropriate is built in its place. Given TPG’s track record in Providence, any tax treaty should be tied to a build clause with a FIRM construction timeline and stiff penalties for failure to meet construction deadlines. A developer’s request for a special tax deal to build a $40-milion hotel in the heart of downtown has led to a tug of war between two powerful labor unions, with the construction trades urging city officials to support the deal and the local hotel workers’ union trying to secure better-paying jobs. 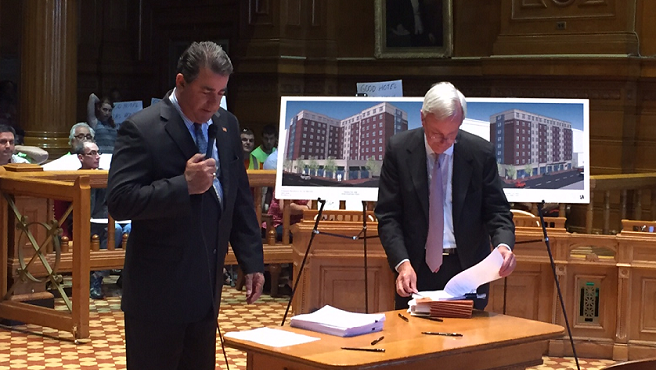 Caught in the middle of the dispute is the Providence City Council, which heard an hour of public testimony Thursday on the 12-year tax-stabilization agreement that has been requested by the Cranston-based Procaccianti Group to build a 150-room extended-stay hotel in place of the vacant Fogarty building on Fountain Street. I’m actually not sure if that’s worse or not. If it’s the same materials as the Omni, then I’m okay with it over the last rendering. The ground level seemed nicer in the first one though. I’m not sure I can think of anything more boring than red brick panels. Remember when David Brussat conceded this area as a modernist playground? Let the modernists play! Both designs are boring and rather ugly. The second, newer design is boring and ugly in a pandering, conventional way. At best, the second design might hope to blend forgettably into the rest of the architecture of the city. That couldn’t be said of the previous design, which would have stood out. That first design looks (to me) like a hospital or a retirement home — someplace depressing, at any rate. What’s the deal with these developers? Do they not want to create spaces that are admired? They don’t even have to spend (much) more money to make these projects unique, admired, fun, and culturally significant. A roof deck, a beer garden, outdoor restaurant space, a street level water fountain, swimming pool with a cityscape view, green parkspace on the roof, balconies on event space overlooking the city, etc. etc. etc. You know… things that bigger cities have. Why the cookie cutter designs? I feel like this entire process has become a “let’s see how cheap of a design we can push and how much in tax breaks we can get” con game. I actually like the brick, its very Providence. I’d say close to 80% if the city is made up of brick buildings, so it fits the surroundings and would fill the space in a functional astatically pleasing manor. Well, Gio, that’s my point about the newer design. It fits better, because of the brick. But it’s ordinary at best. Will it blend? Yeah. Could it be better? Without doubt. It’s uninspiring. Does everything have to be inspiring? No, but this was/is a site where some playfulness (and a touch of inspiration) would do well. I disagree. I think EVERYTHING downtown and in residential neighborhoods DOES have to be inspiring. It has to be spectacular and it has to be interesting and it has to be a place where people want to go and are proud of. But how is that accomplished? Not by architectural bells and whistles, but rather by architecture that answers an urban purpose. That’s what makes a place special. Not distinctive individual buildings, but rather a large collection of buildings adding their functions together in a relatively small area. Downtowns — or rather, I should say, dense urban areas — are special and exciting because lots of people want to occupy them for multiple purposes. If we’re going to criticize this proposal, it should by criticized on that level. Does it meet the basic requirement of being urban in form? And from there, does it have anything to contribute to a multi-faceted downtown environment? After that, the aesthetics are subjective. I am skeptical that we should be subsidizing the Procaccianti’s hotel after how many times they’ve lied to us about their buildings. Either way, why should we be paying for them to build? They’re a huge company.